For people over the age of 10, this year's Spider-Man movie re-boot seems to have emerged rather quickly. Wasn't it just a decade ago that we got the last "first" Spider-Man movie? It was. Well, technically, it's been 3,714 days, which is closer to 10 years and two months. The only thing more depressing than the prospect of there being 10 more Spider-Man movie re-boots is that I probably won't be alive to avoid seeing all of them. There is, of course, some hope. You noticed, I'm sure, that this re-boot happened way sooner than it needed to. Don't we usually go about 20 years between re-boots and re-makes? At least? 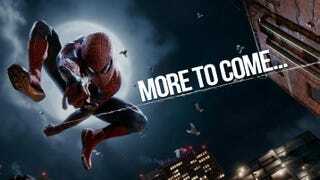 We've gone 10 this time, which raises the possibility that maybe the Spider-Man movies will be released in the same in some sort of asymptotic, Xeno's Paradox-style quickening pace, each re-boot happening in half the amount of time as we had expected, regardless of how our expectations happened. If this is the case, the next reboot won't happen in 10 years (3,714 days, I mean). It'll happen in 5. The one after that will happen in 2 1/2 years. Etc. Oh, I can't stop that list there. The next one (the 12th reboot, including this year's) would be on September 8, 2022. The 13th reboot would be on September 9, 2022. So would the 14th, 15th and the rest of them, Spider-Man re-boots would begin to occur within the same hour, then within the same minute, then the same second. We'd wind up with some sort of Spider-Man movie singularity. Who's excited for more Spider-Man?